Well, MMMM is finally back this week after a hiatus in which I had a work visit to the USA. However, the real reason for the hiatus is the fact that a large bunch of new figures have landed on my doorstep. To be honest it’s been a bit overwhelming in making a decision on where to start. It’s taken me weeks to figure this dilemma out. So the next few weeks of MMMM are going to be filled with new figures. Kinkeshi Premium Volume 3, Translucent versions of Kinkeshi Premium Volume 1 & 2 plus new vending machine figures are some of the things being covered. I wasn’t aware of Japanese figures when the first wave of new sculpts were released in 1991 but if I was, I’d imagine it felt something like how I’m feeling now, having a bunch of new sculpts added to my collection with possibly more to come. This week we will have our first taste of one of the brand new sculpts who seems to be featured regularly & already has appeared in more than 1 line. His name is Nemesis. 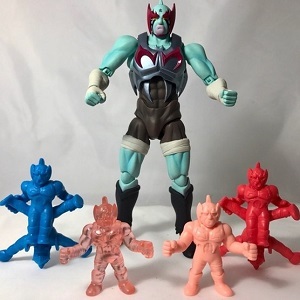 When he first appeared in Kinkeshi Premium Volume 1, I remember writing how this figure is a version of Kinnikuman with what looks like a devil type mask and shirt and is in fact pretty cool, I don’t mind it at all. 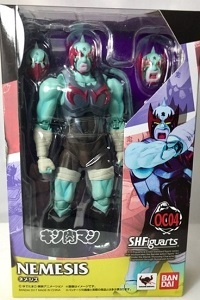 I can say that has been confirmed as a version of Kinnikuman judging by the contents of the boxed SH Figuarts I bought. 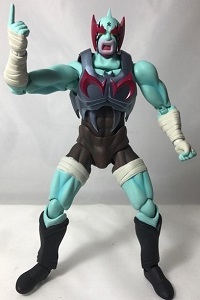 One of the masks included was very Kinnikuman like. I don’t display him like that because the Volume 1 figure isn’t portrayed like that but it’s still good to know. 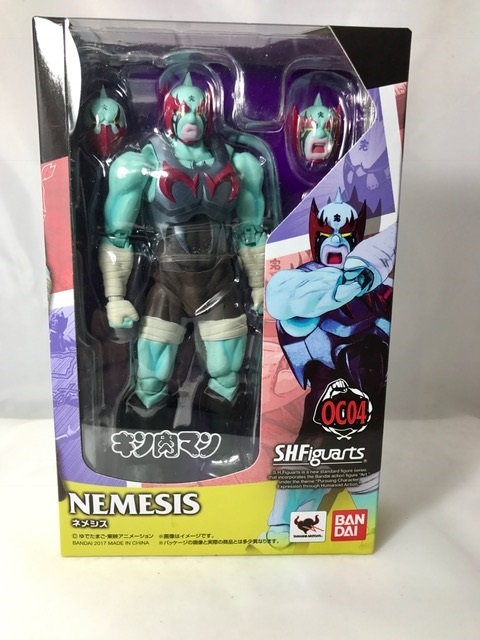 To see one of the new sculpts in full color is very exciting and now having more than 1 version of Nemesis makes him a strong part of the collection, like all the other figures of the same sculpt I display together. The SH Figuarts wasn’t cheap but I’m very impressed, despite them being a bit smaller than I’d first hoped. Moving on from the SH Figuarts version, I have also pictured again the original Volume 1 flesh figure next to his Volume 1 translucent figure to give a taste of what the set looks like. The translucent figures don’t seem to have the same detail as flesh ones but cool all the same. The full set will be covered off in coming weeks. 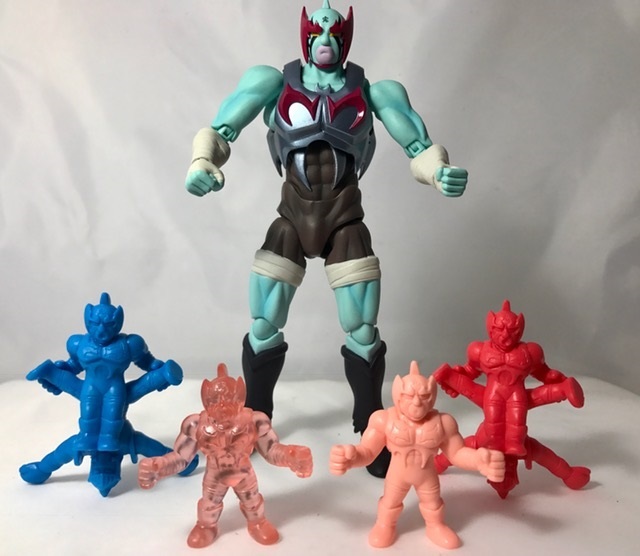 Also pictured are a red and blue paired figures from the new vending machine line which showcases Nemesis wrestling against Robin Mask. 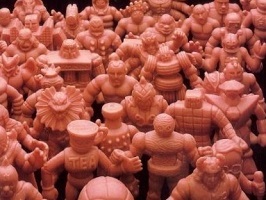 The Japanese love their paired wrestling pose figures and they are common throughout Kinnikuman lines. I personally are not a massive fan of them. However this particular pairing of Nemesis & Robin could very easily be my favorite paired figure of all time. There are a couple of reason for this. Firstly, they are easily matched together. 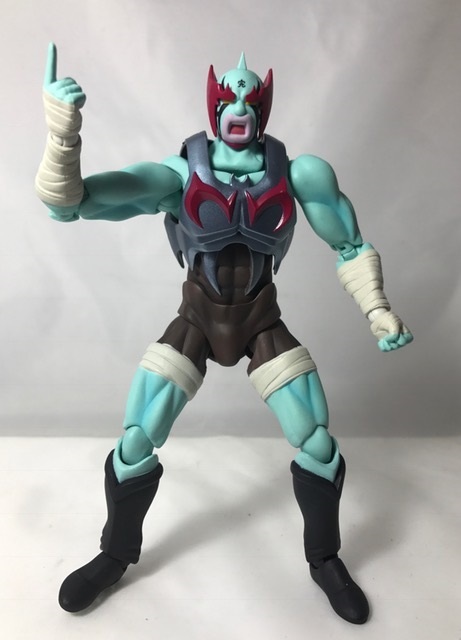 I find most paired figures difficult to put into their position due to fitting limbs into the position they are supposed to be in and when you do get them there, they don’t stay in place and the figure then becomes very difficult to display. Secondly, because most pairs are difficult to display, they don’t easily stand up to be displayed easily without falling over, thus knocking over all the other figures nearby. This pairing stands on its own very easily and looks good doing it too! The fact there is a brand new sculpt included in these is a plus. I absolutely love this pairing. Again, the vending machine figures will be covered in full soon enough. This entry was posted on Monday, September 11th, 2017 and is filed under UofM News. You can follow any responses to this entry through RSS 2.0. You can skip to the end and leave a response. Pinging is currently not allowed.